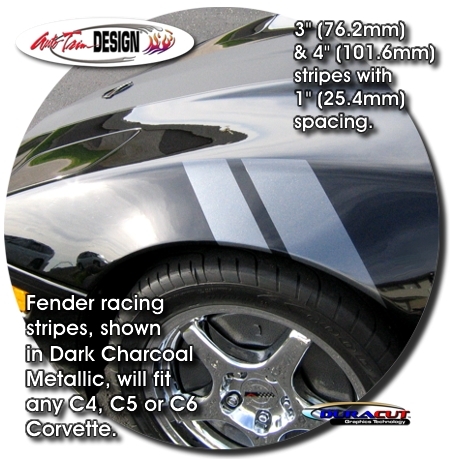 Trick out your Chevrolet Corvette with these unique "Le Mans" Style Racing Fender Stripes that are easily installed on either the Driver side or Passenger side front fenders - or order two (2) sets and do BOTH fenders! Available in various colors (shown in Red), the stripe set measures approximately 28" (71.12cm) in length. Choose from two (2) width styles! 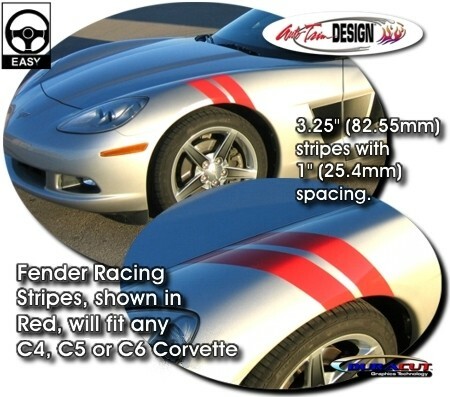 Stripe set, packaged with one (1) double stripe graphic with a 1" (2.54cm) space, will fit any C4, C5 or C6 Corvette. Looks Great! Easy to follow general online application and care instructions are included. 'Click' on picture at left to Zoom image and to view both styles of kits.